Many cultures have long been drawn to and fascinated by the stars above, which makes tattoo birth signs very popular. Ever since we were able to "connect the dots" and form constellations, we've created stories and myths about them. There is a romantic notion and a sort of magnetism to the thought that the stars above have a direct correlation to who we are as a person. Many people feel that these celestial bodies directly influence how we act or can predict the future. This is a worldwide phenomenon and it's no wonder that tattoo birth signs are very abundant and popular. There are many reasons why a person will get a tattoo of their birth sign and in most cases it has a deeper meaning for them than just lookong cool. Many wish to show their pride in their birth sign, in the meaning and what it means to them. Others want them as a way to remember the person they are or could be. These tattoos can be very simple as in the form of tribal tattoos (as noted by the design options below), or they can be very stylized by adding colors, symbols and scenery. This is the most widely used horoscope and it has 12 signs that represent a particular birth month. Each sign has its own personality traits associated with it. Zodiac symbols as a tattoo can include the birth stone or birth color, an animal or other figure or tribal sign. All of these parts can be added to the design to make the tattoo birth signs really come alive. Capricornus (December 23-January 20, The Goat): Prudent and practical in nature, disciplined as well as ambitious, careful and patient. They also can be funny but remain reserved. On the other hand they are prone to pessimism and can lean toward being miserable quite often. Common tattoo locations include the shoulder, hip and chest. Aquarius (January 21-February 19, The Water Carrier): Friendly and humanitarian in nature, many Aquarians find themselves to be very giving and loving. They tend to be very honest as well as inventive and loyal. They also have a tendency to be slightly perverse, unattached and unemotional. Pisces (February 20-March 20, The Fishes): Always represented by two fish Pisces is ruled by Neptune and have tendencies to be kind, compassionate and selfless. On the downside they may also be idealistic, secretive and naive. Aries (March 21-April 20, The Ram): Aries is known as the first sign of the zodiac beginning on the spring equinox. Those born under this sign tend to be adventurous and courageous yet prone to foul moods and impulsive behavior. Taurus (April 21-May 21, The Bull): Rules by Venus, Taurus is also a sun sign. Those under this sign are warm-hearted and patient but yet stubborn and jealous. Gemini (May 22-June 21, The Twins): Like their sign, those born under this sign tend to have a very dual nature. They can be very versatile and adaptive but can also be very nervous and superficial. Though the Roman numeral for two represents Gemini many will use an animal in its place. The focus here is usually on the wolf which represents the famous Roman twins: Remus and Romulus. Cancer (June 22-July 22, The Crab): Those under this sign tend to be loving, caring and possess a strong intuition. Cancerians are also prone to being moody and have an inability to let things go. Leo (July 23-August 22, The Lion): Just as the animal of their sign dictates, Leo's are generous, warm and free spirits but they're also powerful, pompous and bossy. Virgo (August 23-September 23, The Virgin): This is the only sign represented by a woman. Virgo's lean toward modesty and just a touch of shyness but are also worriers and tend to be very conservative. Libra (September 24-October 23, The Scales): Often depicted by the scales, Libra's also attempt to exact this same type of balance in their lives. They are romantic, easy to get along with, and idealistic. Unfortunately they can also be gullible and self-indulgent. Scorpio (October 24-November 22, The Scorpion): Those under this sign are intense, profound and powerful in will and character. They can also be very jealous and resentful of others, compulsive and obsessive. Sagittarius (November 23-December 22, The Centaur Archer): Rules by Jupiter, Sagittarians are happy and giddy people that are optimistic and straightforward. On bad days the Sagittarian can be careless and irresponsible. The centaur represents the dual nature between the animalistic half of human as well as the intellectual. 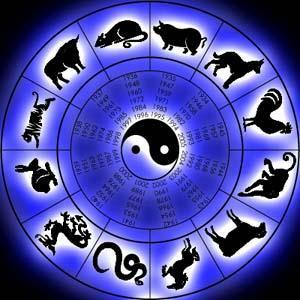 The animal signs present in Chinese mythology a prediction of the person's temperament or personality. Although part of the Chinese culture many do not take the horoscopes seriously but mainly as amusement. You can use the Chinese animal signs as an easy way to ask someone's age as an honest answer would give a 12 year leeway.